This page is here to provide you with an up to date representation of some of the commercial work that we have been a part of. In some of these jobs we have dealt directly with the owners, in others we have dealt with the builders, designers or shopfitters. Please use this list to find a place close to your location and see the quality of our work. 01/02/2016 Baskin Robins, Mt Lawley. 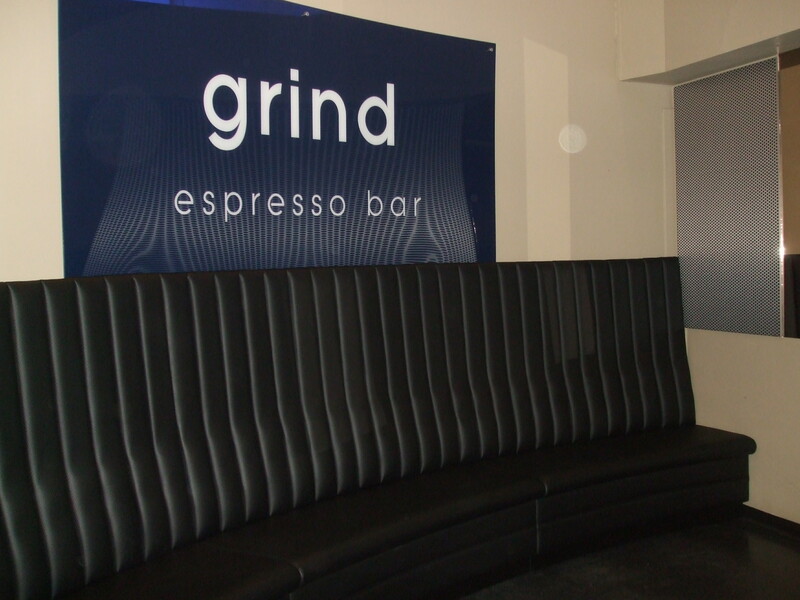 Booth Seating. 20/01/2016 MLC Methodist ladies college. Headboards. 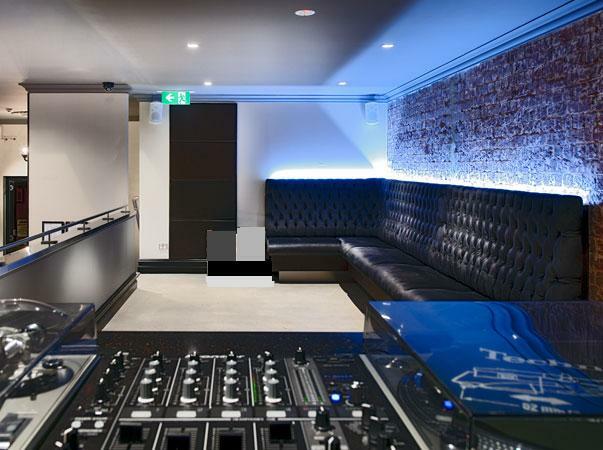 24/11 2015 South Shore Function Centre/Wine Bar. 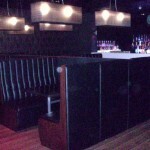 Banquette/Booth seating. 17/11/2015 Curtin University. Banquette Seating to staff breakout. 12/11/2015 Moore Stevens. 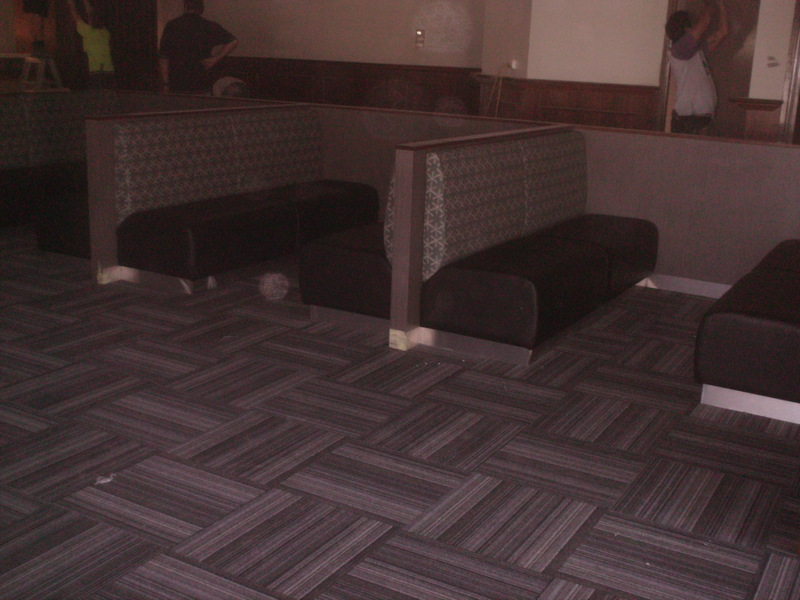 Banquette seating. 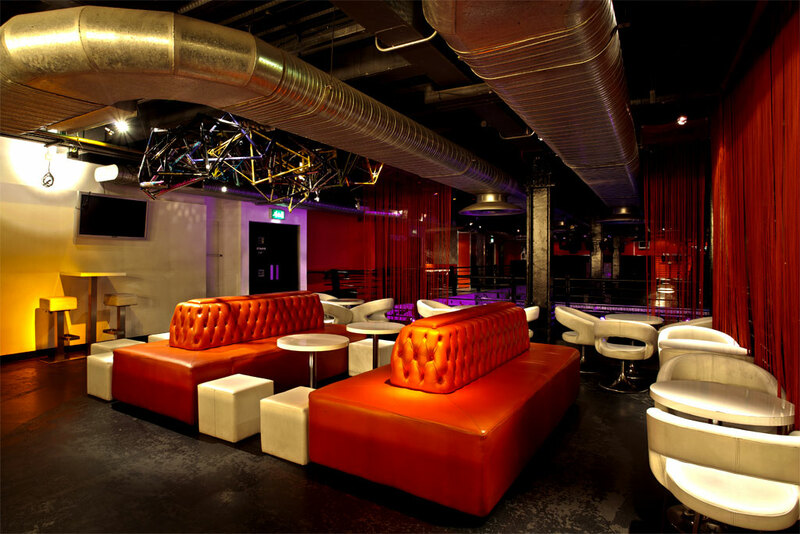 10/11/2015 Connections Nightclub. Bar stools. 06/10/2015 Brotzeit, Joondalup. 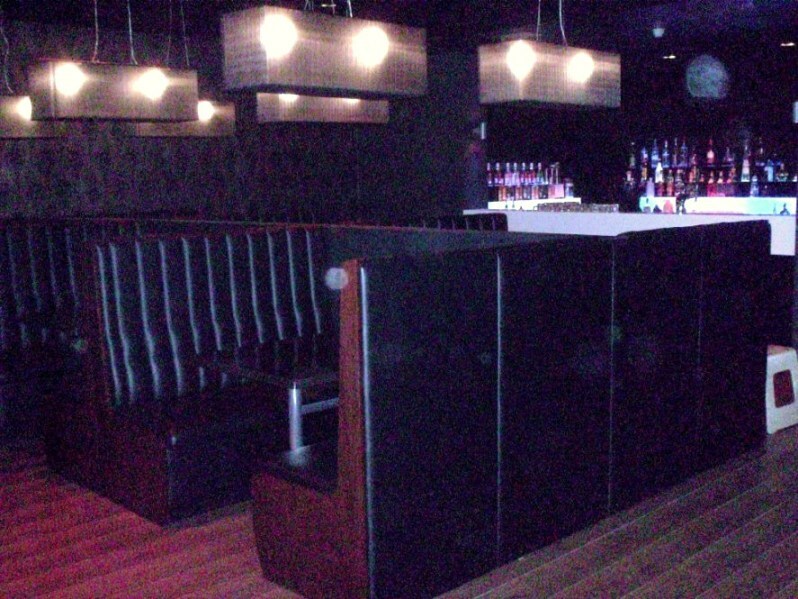 Banquette /Booth Seating. 12/09/2014 The Vines Resort. Headboards for hotel refurbishment. 02/09/2015 Miss Maud, Gateway. Refurbishment. 19/08/2015 Miss Maud, Innaloo. Refurbishment. 03/08/2015 Crepe Cherrie. Joondalup. 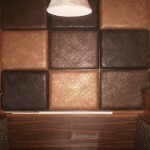 Banquette/booth seating. 26/06/2015 Full Flava Café, Kingsway. 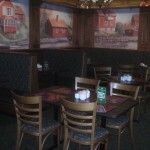 New Banquette Seating. 20/05/2015 The Duke. Carramar Tavern. 06/05/2015 The Corner Stone Ale House. Dining room reupholstery. 09/04/2015 Pan Pacific Hotel. Headboard upholstery. 24/3/2015 Mike Barnet`s Sports Complex, Rockingham. 15/03/2015 Burger Hut. Wanneroo. Custom bench seating. 12/03/2015 The Springs Apartments, Rivervale. Wall Panels. 11/03/2015 Conti Restaurant, Wanneroo. Dining room reupholstery. 11/02/2015 Skin Care Australia, Whitfords. Wall Panels. 01/12/2014 Brotzeit Perth. 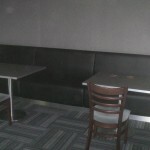 Banquette/Booth seating. 09/07/2014 Rose Hotel, Bunbury. Custom Bench Seating. 30/05/2014 Miss Maud`s, Cannington. Refurbishment. 2/04/2014 Mattisse Beach Club, Scarborough Beach. 20/12/2013 The Jetty Café, Rockingham. 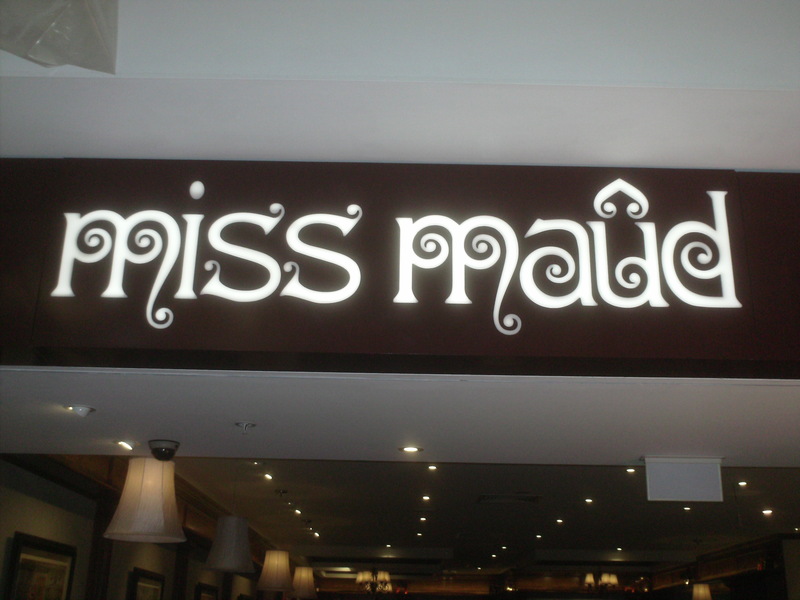 10/12/2013 Miss Maud’s, Joondalup. 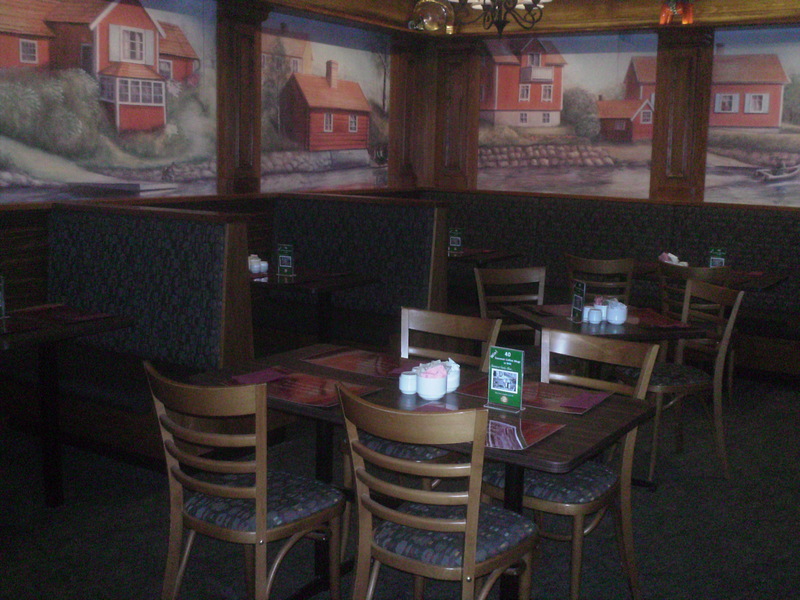 Banquette/Booth Seating. 15/05/2013 The Saint Hotel, Innaloo. 20/11/2012 Whale and Ale, Clarkson. 24/10/2012 Tartine Cafe, Perth CBD. 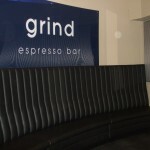 11/10/2012 Grand Central Bar and Resaurant, Perth CBD. 2/08/2012 The Cornerstone Alehouse, Butler. 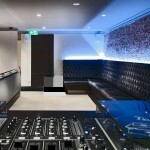 02/11/2011 Deck Cafe, Perth CBD. 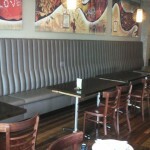 Upholstery of banquette seating and bench seating. 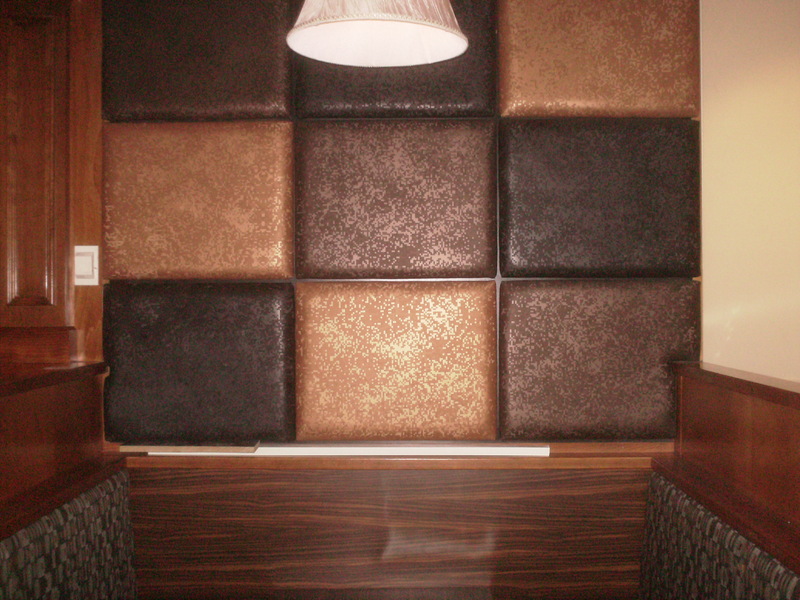 Upholstery of Banquette and Booth seating. 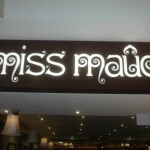 25/08/2011 Miss Maud`s, Warwick shopping centre. 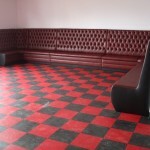 Upholstery to bench/booth seating. Re-upholstery of dining chairs. 19/08/2011 Hyatt Regency Hotel, Perth. 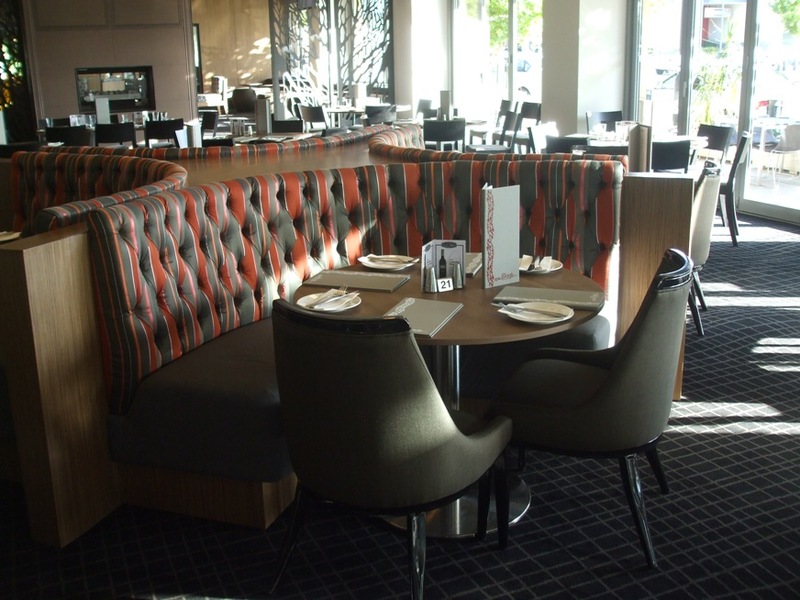 Fluted and curved Banquette seating. 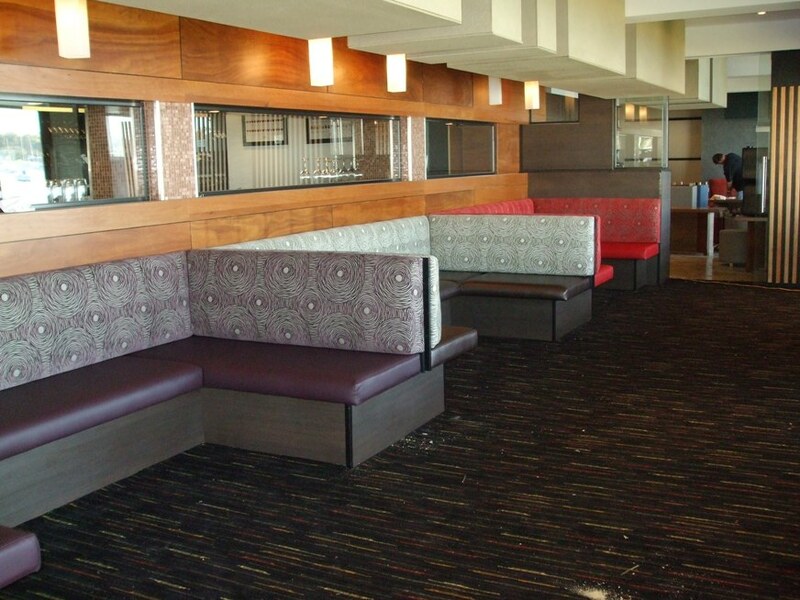 Re-cover part of Bench seating and bar stools. 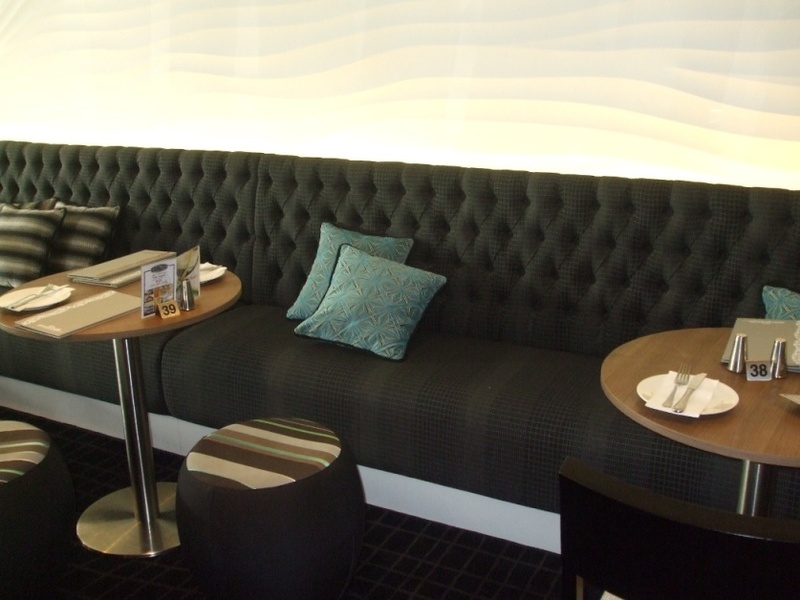 Upholstery to buttoned banquette seating. Re-cover chair for Presidential Suite. 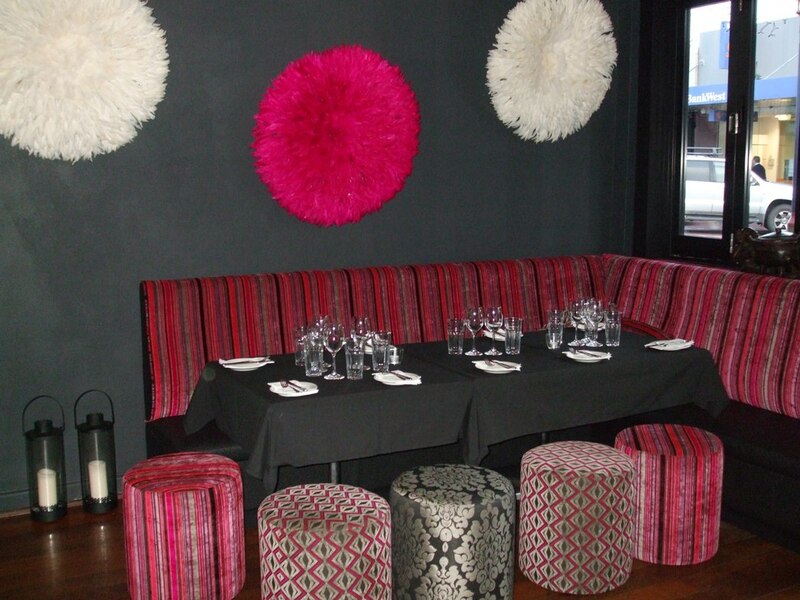 Pink Zulu, Cotesloe: Booth/Banquette seating and other custom furniture. 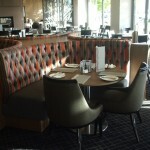 Matilda Bay Restaurant: Bench seating re-upholstery. 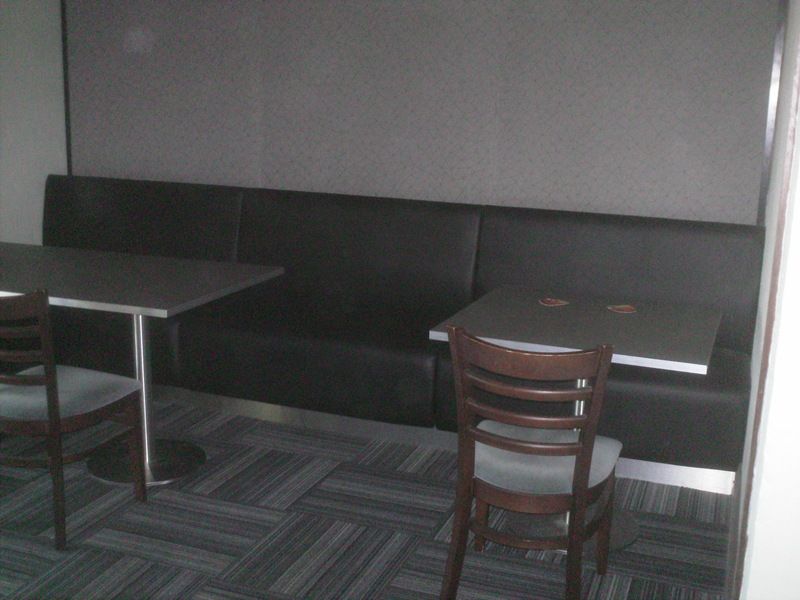 18/11/2011 Paddy Malones, Joondalup: Re-cover Booth seating. 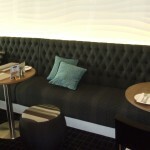 Leopold Hotel, Canning Hwy, Perth: Re-cover bench seating and new ottomans. 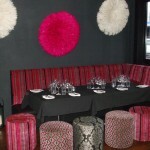 Shape Bar, Hay Street, Perth: Fluted Booth seating. Planet Video, Mt Lawley: Deep buttoned display and more. 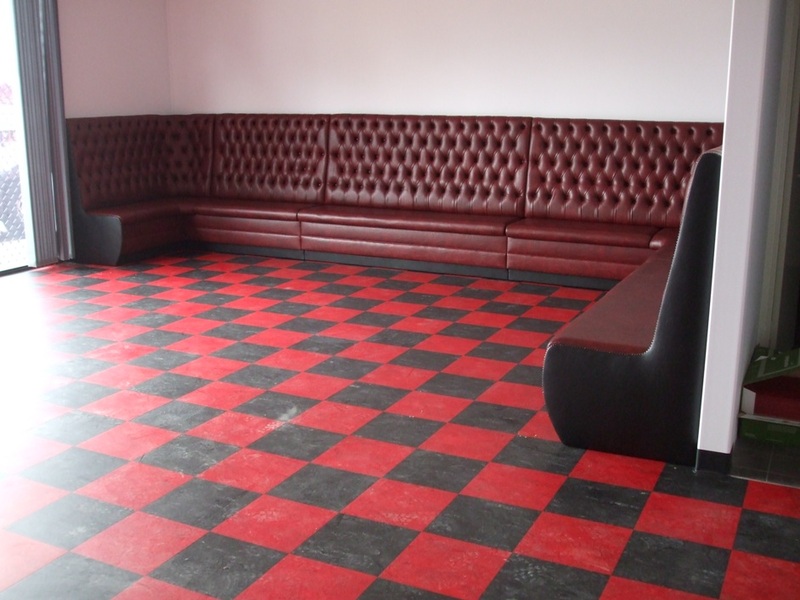 Wolf Lane Bar, Wolf Lane, Perth: Buttoned Banquette seating. Burswood Entertainment Complex: Upholstery of 130 Poker chairs. Hippo Creek: Upholstery of chairs for Sorrento Quay. 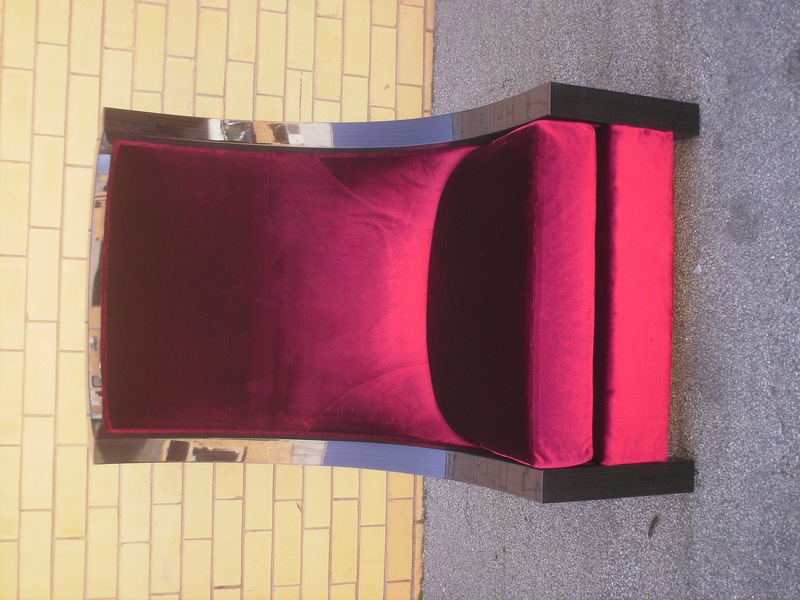 Mirrabooka Senior High School: Re-cover Library chairs. Ballajura Community Collage: Re-cover Library chairs. 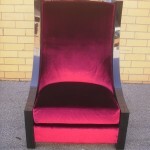 iiNet: Upholstery to office chairs. 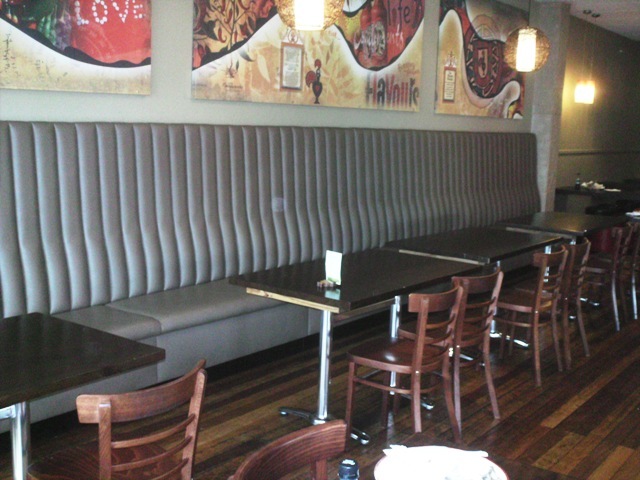 Nandos restaurant, Mt Lawley: Fluted Banquette/Booth seating. 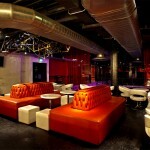 Sound Nightclub, London: Buttoned Banquette seating and more. 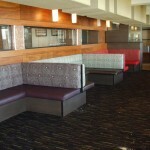 Hilton Hotel, London: Upholstery to new furniture. Coutts & Co Private Banking, Fleet Str. London: Re-cover reception chairs.